I mentioned before that we had a professional film crew in the CAVE a while back, to produce promotional video for the University of California‘s “Onward California” PR program. Finally, the finished videos have been posted on the Office of the President’s official YouTube channel. Unlike my own recent CAVE videos, these ones have excellent audio. These short videos focus on Dawn Sumner, a professor in the UC Davis Department of Geology, and a KeckCAVES core member. This time, Dawn is wearing her hat as a planetary explorer and talking about NASA‘s Curiosity Mars rover mission, and her role in it. On Monday, 03/04/2013, Dawn Sumner, one of KeckCAVES‘ core members, gave a talk in UC Berkeley‘s Art, Technology, and Culture lecture series, together with Meredith Tromble of the San Francisco Art Institute. The talk’s title was “Of CAVEs and Curiosity: Imaging and Imagination in Collaborative Research,” and it can be viewed online (1:12:55 total length, 50 minutes talk and 25 minutes lively discussion). While the talk is primarily about the “Dream Vortex,” an evolving virtual reality art project led by Dawn and Meredith involving KeckCAVES hardware (CAVE and low-cost VR systems) and software, Dawn also touches on several of her past and present scientific (and art!) projects with KeckCAVES, including her work on ancient microbialites, exploration of live stromatolites in ice-covered lakes in Antarctica, our previous collaboration with performing artists, and — most recently — her leadership role with NASA‘s Curiosity Mars rover mission. The most interesting aspect of this talk, for me, was that the art project and all the software development for it, are done by the “other” part of the KeckCAVES project, the more mathematically/complex systems-aligned cluster around Jim Crutchfield of UC Davis‘ Complexity Sciences Center and his post-docs and graduate students. In practice, this means that I saw some of the software for the first time, and also heard about some problems the developers ran into that I was completely unaware of. This is interesting because it means that the Vrui VR toolkit, on which all this software is based, is maturing from a private pet project to something that’s actually being used by parties who are not directly collaborating with me. Yesterday, Wednesday, 01/09/2013, Michael Meyer, the lead scientist on NASA’s Mars exploration mission, which includes the ongoing Curiosity rover mission, visited UC Davis as a guest of Dawn Sumner‘s, the KeckCAVES scientist working on that same mission. Dr. Meyer held a seminar in the Geology department, and also gave an interview to one of our local newspapers, the Sacramento Bee. As part of this visit, Dawn showed him the CAVE, and the Mars-related visualization work we have been doing, including Crusta Mars and our preliminary work with a highly detailed 3D model of the Curiosity rover. You might have heard that NASA has a new rover on Mars. What you might not know is that KeckCAVES is quite involved with that mission. One of KeckCAVES’ core scientists, Dawn Sumner, is a member of the Curiosity Science Team. Dawn talks about her experiences as tactical long term planner for the rover’s science mission, and co-investigator on several of the rover’s cameras, on her blog, Dawn on Mars. Immersive 3D visualization has been used at several stages of mission planning and preparation, including selection of the rover’s landing site. 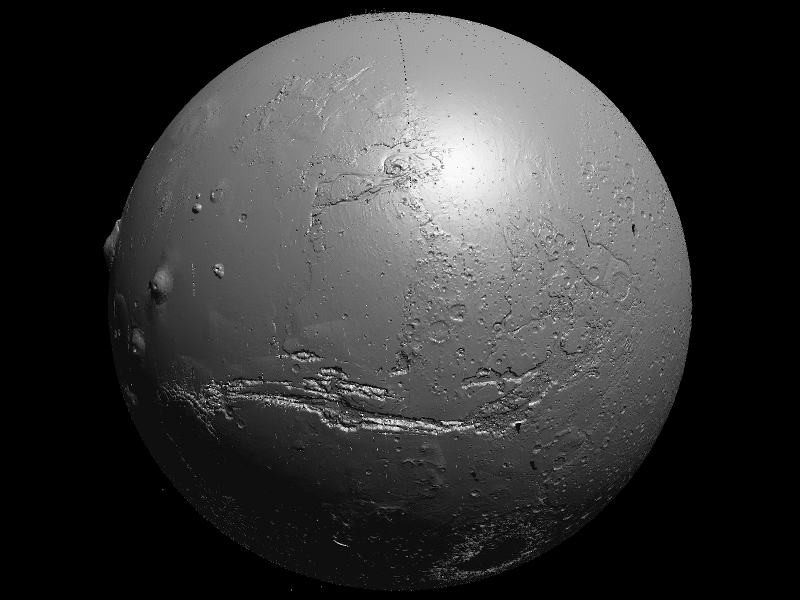 Crusta, the virtual globe software developed by KeckCAVES, was used to create a high-resolution global topography model of Mars, merging the best-quality data available for the entire planet and each of the originally proposed landing sites. 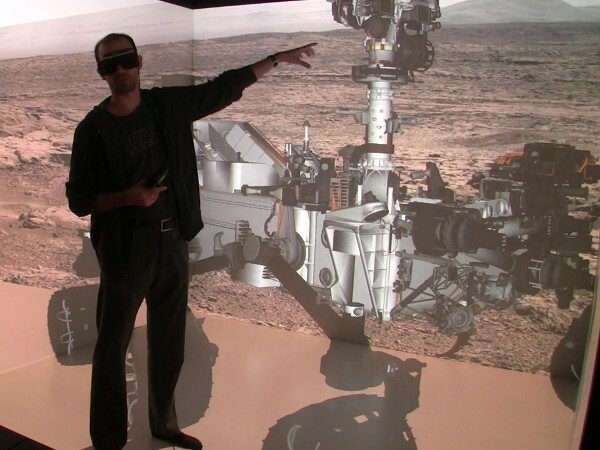 Crusta’s ability to run in an immersive 3D display environment such as KeckCAVES’ CAVE, allowing users to virtually walk on the surface of Mars at 1:1 (or any other) scale, and to create maps by drawing directly on the 3D surface, was important in weighing the relative merits of the four proposed sites from engineering and scientific viewpoints. We filmed this video entirely virtually. Dawn is working with Crusta on a low-cost immersive 3D environment based on a 3D TV, which means she perceived Crusta’s Mars model as a tangible 3D object and was able to interact with it via natural gestures using an optically-tracked Nintendo Wii controller as input device, and point out features of interest on the surface using her fingers. 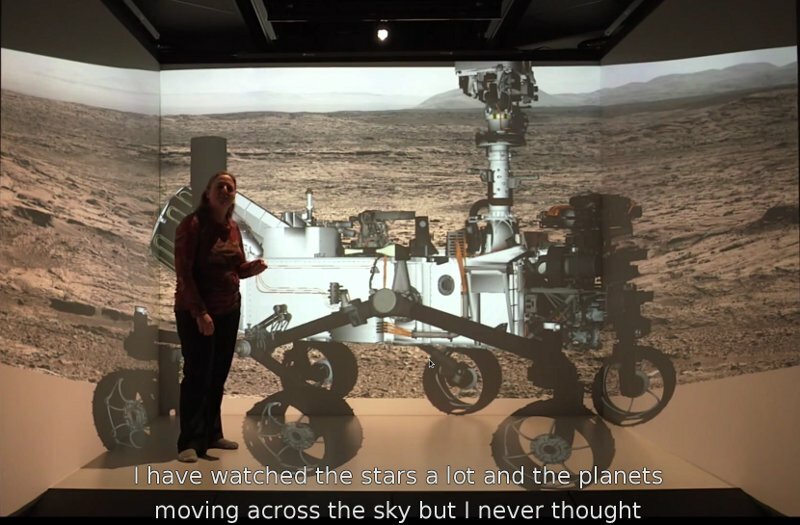 Dawn herself was filmed by two Kinect 3D video cameras, and the combination of virtual Mars and virtual Dawn was rendered into a stereo movie file in real-time while she was working with the software. Now that Curiosity is on Mars, we are planning to continue using Crusta to visualize and evaluate its progress, and we hope that Crusta will soon help planning and executing the rover’s journey up Mt. Sharp (NASA have their own 3D path planning software, but we believe Crusta has useful complementary features). Furthermore, as the rover progresses, it will send high-resolution stereo images from its mast-mounted navigation camera. 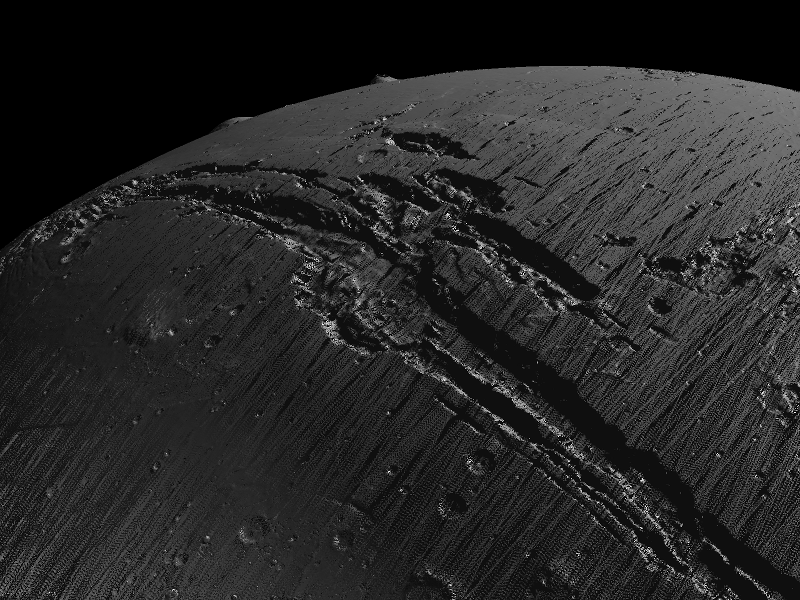 Several KeckCAVES developers are working on software to convert these stereo images into ultra-high resolution digital terrain models, and to register these to, and integrate them with, Crusta’s existing Mars topography model as they become available. The white arrow in panel A shows the location of the rover’s high-resolution data patch shown in panels B and C. In panel C, a stratum of rock — identified by its different color — was selected, and a plane was fit to the selected points (highlighted in green) to measure the stratum’s bedding angle. The above images were created with LiDAR Viewer, another KeckCAVES software package. LiDAR Viewer is used to visually analyze very large 3D point clouds, such as those resulting from laser scanning surveys, or, in this case, orbital and terrestrial stereo imagery. The terrain data we expect from Curiosity’s stereo cameras will be even higher resolution than that. The end result will be an integrated global Martian topography model with local patches down to millimeter resolution, allowing a scientist in the CAVE to virtually pick up individual pebbles.